Oftentimes in litigation, parties continuously seek the all-important piece of evidence to help win their case. This vastly important piece of evidence is sometimes known as a “smoking gun.” Some examples of a “smoking gun” may include the video of an injury that occurred on the premises of a business that clearly shows the injury was the fault of a third party, or an important email that indicates sexual harassment or racial discrimination. However, it is not always easy to obtain this information and unfortunately sometimes parties choose to destroy evidence in hopes of hiding any evidence that may confirm their legal liability. 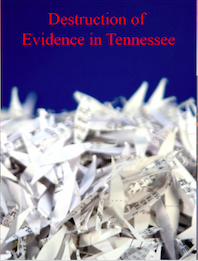 What happens if a party destroys relevant evidence? In Tatham, the plaintiff was in a serious car accident. Plaintiff alleged that the car accident occurred due to the failure of a new tire purchased from Defendant. Plaintiff brought a products liability case against the seller and the manufacturer. At the instruction of her insurance company, the plaintiff transferred title to the vehicle (and tire) to a third-party wrecker service. In ordinary practice, the wrecker service destroyed the tire and car. After the car and tire were destroyed, Plaintiff filed suit against the defendants. The defendants filed a motion for summary judgment requesting the court to dismiss Plaintiffs case because the tire was destroyed, and Defendants were prejudiced because they never got a chance to inspect the tire. The trial court refused to award the sanction because it held the plaintiff did not intentionally destroy or otherwise spoliate the tire. The Defendants appealed, arguing the trial court abused its discretion. This issue was addressed by the Supreme Court. The Supreme Court upheld the Trial Court’s decision not to award sanctions and in the process developed a new four (4) factor test for the Trial Court.